Our Tuxedo Sale Begins Monday! With Thanksgiving coming up just around the corner we all begin thinking about the holidays. For many, holidays mean Christmas parties, charity galas, and New Year’s extravaganzas. We don’t know about you but here at 9tailors we believe that one should celebrate in style and what can be more stylish than a spiffy new tuxedo? If you haven’t purchased a tuxedo in a while or if you don’t own one yet, now is the PERFECT time. 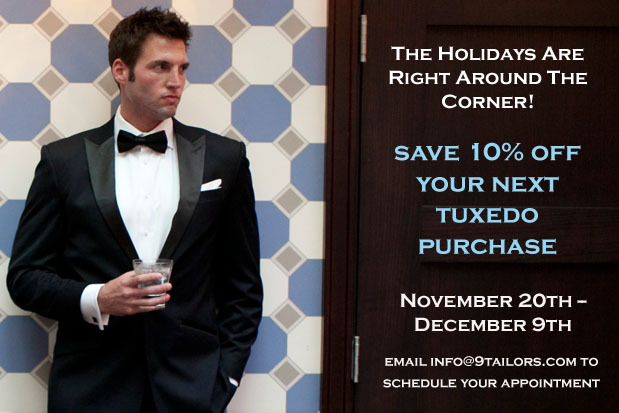 Beginning this Monday, November 20th we are offering 10% off your tuxedo order. Call us at 617-286-6135 or email info@9tailors.com to set up an appointment with one of our fabulous style consultants. The promotion applies to all fabric levels. A la carte design options are still full price.